Surf the Internet, watch live TV, movies or play online games, wirelessly share your videos, music, and photos of your ISO or Android devices. download Apps as you like, no extra cable or adaptor necessary. 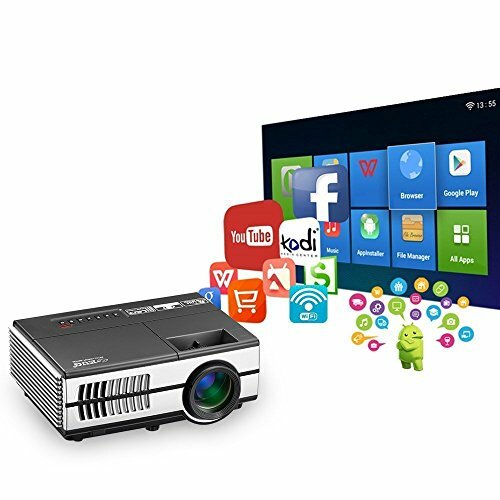 1500 Lumens mini video projector with high transparency full glass lens, which is mainly used for professional SLR cameras, it doesn't run the focal, more higher resolution. Ensures you enjoy HD natural image quality. Built-in dual hi-fi speaker, supports Dolby digital decoding, no limit in music playing. The 3.5mm Audio jack for external speakers or headphones connectivity. Supports Bluetooth(requires 3.5mm bluetooth transmitter, package not included). The projector is ultra silent as it operates with a fan noise of only 32db, which is the same as a high quality laptop. ✓ Equipped with HDMI, VGA, USB port, etc. Multiple interfaces perfectly accommodated your iphone, ipad, laptop, smartphone, tablet, Mac, game consoles, keyboard, mouse, and more! Suitable for Home theater, Movie night, Sports, Photo slideshows, Video games, Outdoor Camping. ✓ Just plug USB Flash Drive into your projector and start streaming in seconds, eliminating the need for a PC. Supports horizontal and vertical flip image flip function, which enables font/ rear/ ceiling projection. ✓ About us:11 YEARS EXPERIENCE on Projectors Manufacturing and Developing. CCC,CE,FCC,CB Certificated. 12-Month Worry-Free Warranty and Free Life-time Technical Support. The seller fulfillment orders also can be delivered within 2-4 days.